Successfully Added USB Hub and Speaker to your Shopping Cart. USB Hub and Speaker with Blue LED light, this cool new USB hub is the multi-function USB gadget your desk has been waiting for. Not only does it come with 3 USB ports and blazing fast USB 2.0 data transfer speeds, this USB hub and speaker also doubles as a powerful digital speaker AND comes with 6 blue LED lights to make for a great decoration on your desk. USB Hub: The 3 USB 2.0 ports on this USB hub and speaker work with all USB devices, so you can charge your iPod on one, iPhone on another, and then plug in another USB hub and speaker on the last! That's right, you can daisy chain together up to 127 devices for not only more USB ports, but also an amazing pattern of blue LED light on your desk! 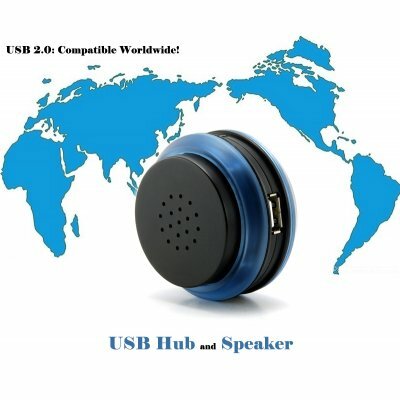 Digital Speaker: The standard 3.5mm audio out jack on this USB hub and speaker will connect to all of your favorite multimedia devices, including your iPod, PSP, NDS, CVFH-N03, MP3 player, MP4 player, laptop, notebook, netbook, CD player, mobile phone, and PDA. No external power is needed, just simple plug and play! If you’re looking for a solid resale item that can make you some great profit before everyone else, then this USB hub and speaker is that product. Place your orders today while supplies last and we will express ship it to you by tomorrow. This USB hub and speaker comes with our famous 12 month guarantee and is in stock now in our warehouse right now. Brought to you by the leader in wholesale electronics, Chinavasion. Does the LED light come in any other color? This USB hub and speaker is only available with blue LED lights for the time being. Other colors might be available in future if there is popular demand for it. Can I daisy chain a few of these USB hub and speaker devices together to have them all play music together? There is only one 3.5mm audio port on each device, so each USB hub and speaker can only play audio from one source. However, you can connect your CD player to one and iPod to another to have them play at the same time.